Microsoft has made a bold play by announcing a 'controller free' Xbox experience called 'Project Natal' using full body motion capture and voice recognition offering a jaw-dropping concpet of the future. Steven Spielberg was on stage to support the project – which was not given a launch date. "I often asked how can the interactive entertainment become as approachable as any other form of entertainment," said Spielberg. "The vast amount of people are too intimidated to pick up a games controller. 60 per cent of people do not own a video game console so the only way was to make the tech invisible and then they can shine in the spotlight. "It's not reinventing the wheel, its about no wheel at all." 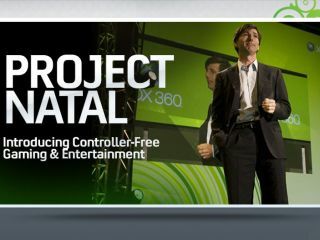 "Today with cultural visionaries at our side and controller-free gaming on our horizon, Xbox 360 authored a new page in home entertainment history," added Don Mattrick, senior vice president for the Interactive Entertainment Business at Microsoft. "For us, this E3 is about breaking down barriers — between generations, between games and entertainment, and most important, between video game players and everyone else — in a way that only Xbox 360 can." Microsoft showcased a whole host of functionality whilst on stage, including a dodgeball 'Ricochet' game, navigating through the Xbox live menus and collaborative painting. It was a massively impressive concept from Microsoft, backed by one of the world's most admired directors, and if it is truly as powerful as the demonstrations suggest it could be as pivotal to the gaming industry as the Wiimote proved a few years ago.